More than 78,265,095 beer lovers served! 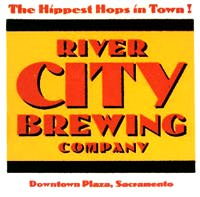 Not to be confused with the River City Brewing Company of Jacksonville FL, nor the one in Wichita KS. OK beers and good — but pricey — food here. Try the "Cowboy Pasta". Directions: Find the Macy's on L Street, then find the nearby parking garage. Park there, go into the attached mall, and you're there. Red-brown, clear. Spicy aroma. Some...I dunno, acidity? Tannins? (In the nose?) Very brown flavors. Tannic. Sweet in finish. Astringent. Amber clear. Thin head. Caramel aroma, and Goldings. Bitter. Slightly roasty...slightly inappropriate. Yellow, thin head, sparse carbonation. Some Hallertauer aroma. Bitter...not quite enough. OK body. Very cold. Looks pretty black. Coffee aroma...not very assertive. Thin, good roasty coffee/black malt flavors.